Customers simultaneously want the warmth of human communication and the speed and efficiency of automated service. It’s a paradoxical challenge for companies, one brought about by increasing levels of consumer expectations and the fast changing technical landscape of customer communications. Multi-channel customers are less patient and expect more than they did five years ago. 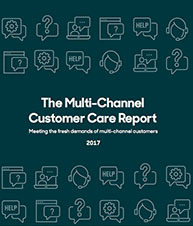 Multi-channel use has increased considerably in three years, with more diverse channels available to customers. Customers are developing distinct expectations for each support channel. Higher expectations are balanced by a more relaxed approach to sharing personal information—but only if doing so improves service. This report explores these key areas further, providing deep insight for businesses keen to stay ahead of their competition through improvements in their customer service strategies.